Javier Muñoz-Basols’ principal research interests are: Spanish language, translation studies, applied linguistics, stylistics and literary linguistics and cultural studies. He has also published on Early-modern and medieval Spanish literature, Latin American cultural studies and modern Spanish literature. His current research focuses on cross-linguistic lexical influence and the interaction between language and culture in various settings, including contemporary literature and humour. Javier’s research in the area of Spanish language learning has led to the publication of textbooks focused on error correction, writing skills, oral interaction and idiomatic language. He is the creator and editor of the Routledge Speed up your Language Skills Series, which publishes innovative texts based on error correction as an effective tool for improving students’ language skills. Following the original approach of Speed up your Spanish the series has grown to include Chinese, Arabic, French, Korean and German. 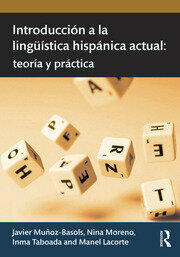 He is also editor of the Routledge Advances in Spanish Language Teaching Series, which showcases the latest research on the teaching and learning of Spanish. Javier delivers teacher training workshops on language teaching regularly. He is a member of www.todoele.net, a leading platform dedicated to Spanish language teaching; and a founding co-editor of the Journal of Spanish Language Teaching(Routledge), an academic publication dedicated to research, methods, materials and theories on the teaching and learning of Spanish.